I haven’t been doing many challenges recently…it’s that full time work thing (and feeling a bit under the weather). Anyway I just couldn’t resist combining two of my VERY FAVORITE challenges – CAS-ology (Dots) and colourq (it wasn’t posted on the site but I found it on one of the design team members). I did substitute Real Red for Poppy Parade! Whisper White – 3 1/2 x 4 3/4. It’s hard to see but I score two lines 1 1/8 and 1 1/4 from the right side. Add to card front using dimensionals. Stamp greeting in Real Red, cut out with matching Starburst framelit. Add Pool Party Twine (SAB) bow and add to card front using dimensionals. Island Indigo – 3/4″ Circle Punch, Basic Grey 1/2″ Circle Punch. Add using dimensionals. Basic Rhinestones to finish it off! Don’t you just LOVE CAS? I know that I do! 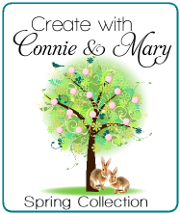 And just a quick reminder this is Preview Week for Create with Connie and Mary Spring Collection 2014! If you missed it…I shared my FUN preview project yesterday…CHECK IT OUT! And don’t forget…with PREVIEW WEEK comes BLOG CANDY!!! Head over to the Create with Connie and Mary site to see who is offering it today…HINT: There are TWO CHANCES today! This entry was posted in Challenge, Clean and Simple (CAS), Create with Connie and Mary and tagged Starburst Sayings. Bookmark the permalink. Wonderful card. I love how you’ve got embossed and die cut dots on your very cheerful card. Thank you for playing along at CASology this week. Very fun card Mary, fantastic design. Thank you so much or joining us this week at CASology! Your card is so pretty and clean!! I hope you get to feeling better soon. I have a little cold myself. Mray i love the embossing,. Thank you so much for joining us this week at the colourQ! Such a fun card, Mary, love what you did with these colors! Thanks for playing with us at the colourQ.